If you are like me, you grew up and into The Princess Bride. Probably your vocabulary is full of phrases like, “I’m not a witch, I’m your wife!, He’s been mostly dead all day., Mawwiage., It’s possible. Pig.” … the list goes on and on and on. And, although I have been a fan since the movie went to VHS and we all discovered it, I knew very little about how it came to be. 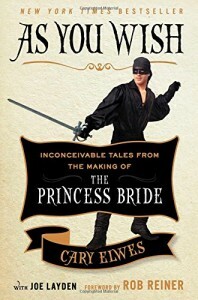 In this memoir, Cary Elwes gives us the behind-the-scenes action, low-downs and secrets of how the greatest love story ever told became a cult classic that remains a timeless tale of love, adventure and friendship. Elwes beautifully recounts what a great book, spot-on screenplay, brilliant directing and an all-star cast can pull off. But even more than that, Elwes shares how the friendship and community they developed was one of the greatest treasures a pirate could ever hope to find. As the wildly talented cast lived, worked, ate and laughed together for months of on-location shooting, they created a chemistry and mutual admiration that transcended lines, plot and directing and resulted in a movie that continues to gain fans and followers 25 years later. My best recommendation is watch the movie, read the book and then watch again. To be disappointed is INCONCEIVABLE! What is your favorite camp experience? When did you first discover The Princess Bride? Which line do you quote most often?